Researchers Daniel Wundersitz, Luke Daly, Sona Jurkova and Rodrigo Bini. Forget gold, Bendigo is on the way to being famous for something else of value. Cycling biomechanics research. Cool, hey. Exercise physiology lecturer Rodrigo Bini says biomechanics research is popular all over the world, “but if you filter that down into who’s doing cycling research, it’s only a handful of places”. And we’re fast becoming one of them. “I think it will be good in the long term, Bendigo has the potential to grow into a good research hub on cycling,” Rodrigo says. 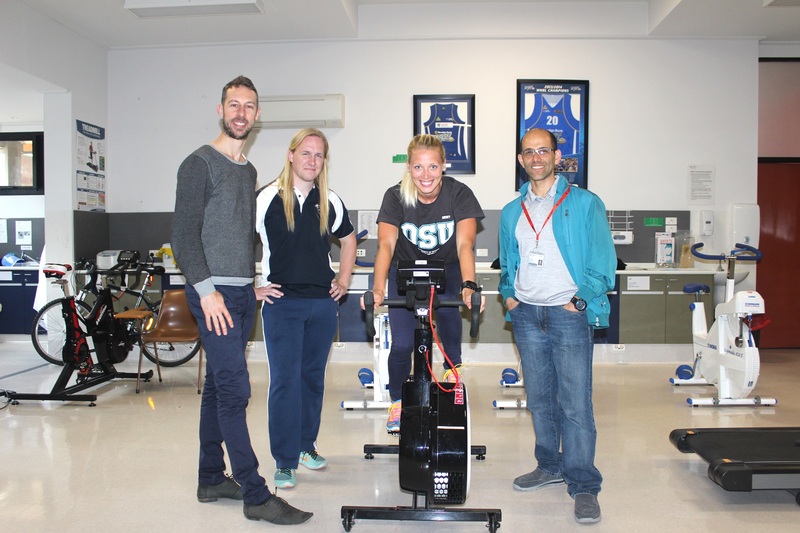 The Brazilian-born academic has been on the Bendigo Campus for almost one year and in that time has helped attract a passionate group of student researchers from around the world, equally enamoured with the science of cycling. One of those is Sona Jurkova, a visiting PhD researcher from the Czech Republic, who farewells Bendigo today after a month progressing her research into cycling fatigue. Talking about fatigue… Sona says she’s not looking forward to the two-day flight back home, although the travel pain has been well worth the experience of working with Rodrigo. She’d read some of his research at her home university and decided Bendigo was the place she needed to be. The work being done in the campus exercise science labs is also getting noticed closer to home. When the Head of Cardiology at Bendigo Health discovered a pattern of cyclists around Bendigo presenting with heart abnormalities, he contacted our exercise physiology department to see if our researchers could work out why. Cue post-doc researcher Daniel Wundersitz and PhD student Luke Daly, who are part of a team looking into the problem. The team secured a grant to test and monitor a group of 15 cyclists who took part in a recent Western Australia-to-Bendigo charity ride. The cyclists were put through an echocardiograph, 12-lead ECG, 24-hour Holter monitoring and blood tests before and after the 21-day ride. Researchers are now studying those test results, looking for any effects and changes on the cyclists’ heart health. “Because there’s such a big cycling culture in Bendigo it’s very beneficial for the cycling community to understand what’s happening,” Daniel says. Rodrigo would say the same thing. He completed his own PhD in New Zealand, then went back to Brazil to lecture for five years before moving to Bendigo. “I was doing a lot of teaching but wanted to develop something more research-based,” he says. He says Bendigo is the perfect place to become a hub for cycling research. Not only does the campus boast a brand new state-of-the-art exercise physiology lab, and a host of dedicated academics, the city itself is mad on cycling. With many groups of social cyclists, mountain bikers and road riders in the saddle every day, there’s no shortage of potential research participants.